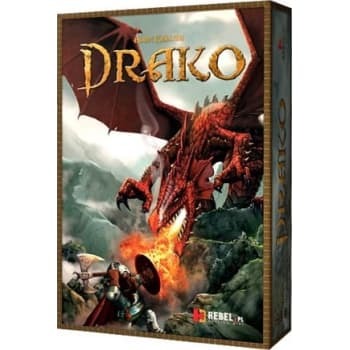 Drako is a game for two players who take on two different roles. One of them leads a team of dwarves, experienced dragon hunters. Second one plays a red dragon that spreads the terror amongst local peasants. This fight to the death takes place in a small valley surrounded by rocks, in which the chained dragon has little room for maneuver, but still enough to provide serious threat for the dwarves. If the dwarves kill the dragon before it breaks from the trap (that is before dwarves run out of cards) - they will win. If the dragon survives or defeats the dwarves, he will manage to free the trapped leg and will fly away, triumphing over his opponents.